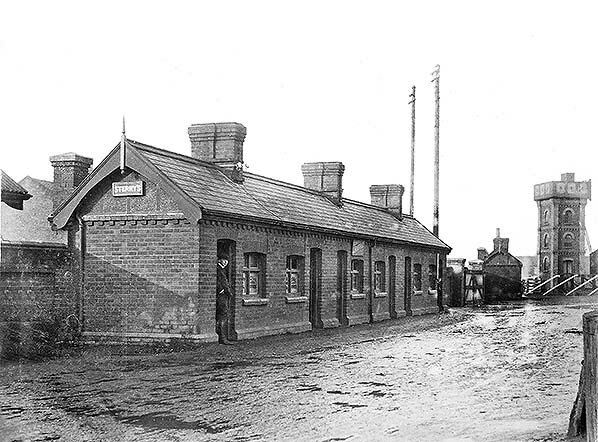 Sterry & Co coal merchant's office at the entrance to the coal yard in 1908. The water tank is at the south end of the coal sidings. 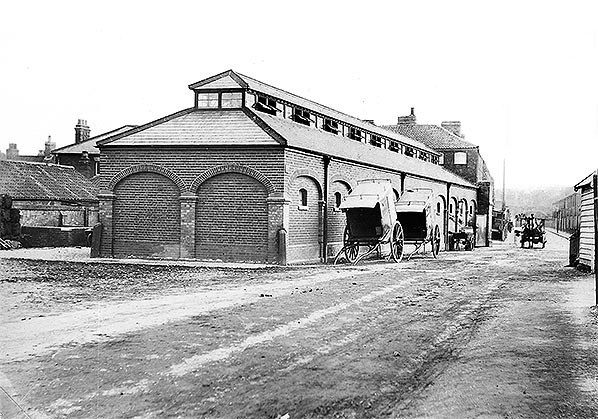 An interesting view of the stable block at Norwich City goods yard. The view is a little unusual in that it is looking towards the entrance from Heigham Street and thus with the goods yard itself behind the camera. Unfortunately the date is unknown but is almost certainly during the late Victorian to Edwardian period, 1885 - 1910. An 1884 map shows the building did not then exist but had appeared by the time a 1908 revision of a 1905 map was published by the Ordnance Survey. The building itself is curious; the clean brickwork and mortar suggesting the photograph was taken soon after completion yet some of the brickwork, albeit with clean mortar, appears older. It should be remembered that until well into the 20th century, towns and cities had belching chimneys everywhere and buildings quickly became blackened. The rebates in the walls are likely deliberate decorative features and not bricked-up former arches, while the impressive clerestory would have provided ample light and ventilation for the interior. 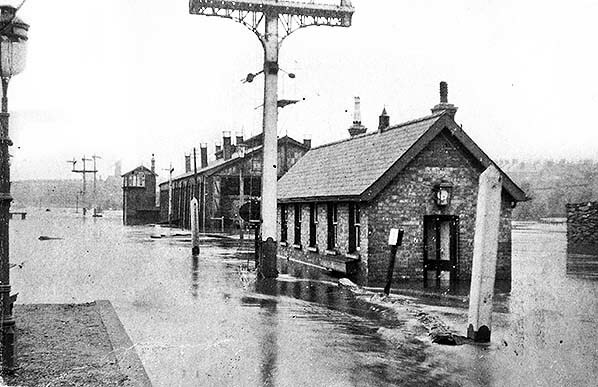 The bollards at the corners, probably of cast iron, were to prevent damage to the corners of the building by road vehicles. At far left is what appears to be stacked bales of hay while to their right is what was probably a manure pen. A number of horse-drawn road vehicles can be seen. The pair of single-axle vehicles nearest the camera are absolutely typical of local delivery vehicles within towns and cities during Victorian and Edwardian times. They were used for light deliveries such as by grocers, bakers, butchers, kitchen utensils and other hardware suppliers as well as for delivery of parcels and newspapers. Those in this view may have been owned by the railway but more likely by cartage agents contracted to the railway. Unfortunately any sign-writing is not visible but almost all such vehicles were so-adorned, some quite elaborately. The hut just visible on the right contained a weighing machine but quite when this was installed in unclear. Beyond the entrance, Heigham Street passes left to right and the street directly ahead is Sayers Street, with what were known as Sayers Buildings standing on its north side. Today in this part of Norwich much of the street layout off the west side of Heigham Street remains little altered but the east, railway, side has changed almost beyond recognition. Sayers Street is now lined with modern buildings but a short section still retains cobbles as a nod to bygone times. 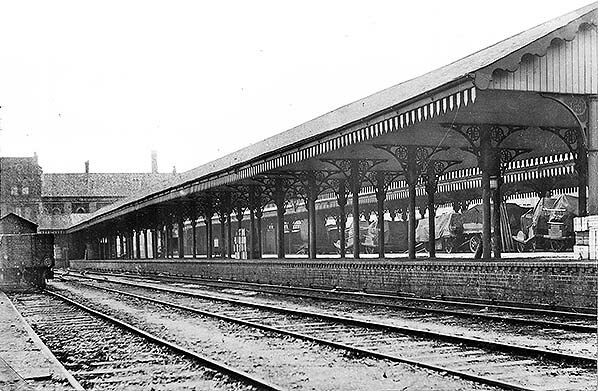 Norwich City station looking towards the station building on a unknown date but perhaps within the first two decades of the twentieth century. Dominating the scene is Platform 1 on the east side of the station. The centre track is the locomotive release road while at far left is the Down side siding, part of the station's goods facilities. The rails appear to be short lengths, probably twenty feet as was once quite common. 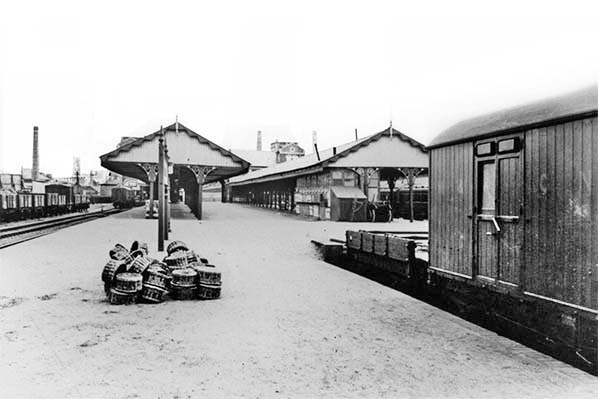 In the left background can be seen the entrance arch through the station building which led directly onto what is usually known as a cab road between the two platform canopies, the bay platforms at Norwich City being located further north, to the right of the camera. The 'cab road' in this case seems to have been mostly used for goods and, as it happens, an interesting selection of loaded road vehicles may be seen. Some of these vehicles are single axle low-loading types while at least one of the two axle vehicles has rubber, albeit solid, tyres. The latter type was commonly hauled by road locomotives, i.e. steam traction engines. On the nearest platform are seen stacked boxes and crates, strategically positioned ready for loading onto a train. Just visible are the 'EMR' (Eastern & Midlands Railway) monograms cast into the spandrels supporting the canopy. Each spandrel is identical but their mounting on opposite sides of the stanchions means one monogram of the pair is reversed, meaning that one can be seen right-way-round either side of a stanchion. This was common practice among most railway companies, being by default the result of using a single casting mould. Platform lighting, just visible beneath the canopy, is of the casement type and something of a mystery regarding dates, as other photographs, some later and some thought to be earlier, show suspended globe type lighting. 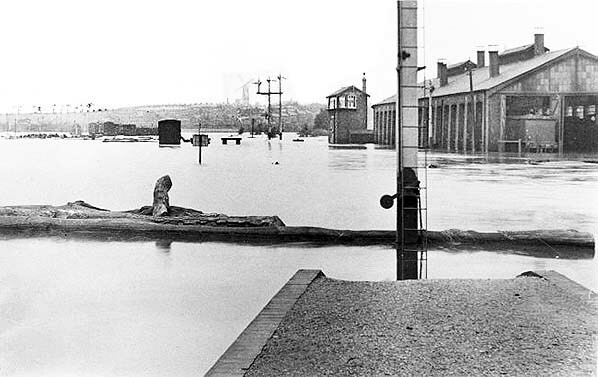 Three people look over the west platform towards the timber yard at Norwich City in August 1912, surveying the extensive flooding. This northwards-facing view is again believed to have been taken the following day, Tuesday 27 August, and shows the flooded engine shed and tracks outside Norwich City station viewed from one of the platforms. At least two locomotives are in the shed while in the foreground two tree trunks lie across the tracks. At the time this photograph was taken, the water would have been receding and lying just a few inches deep. In the distance the railway curves north-westwards towards Hellesdon station. In the far distance and left of centre can just be discerned Upper Hellesdon windmill. The 88 feet tall mill, which stood on Press Lane and was the third mill on the site, was constructed in 1875. On 4 May 1913 the mill caught fire due to an electrical fault in the rolling mill which stood at its base and never worked again. It was finally demolished in 1920 and its bricks reclaimed for use in a house building scheme. 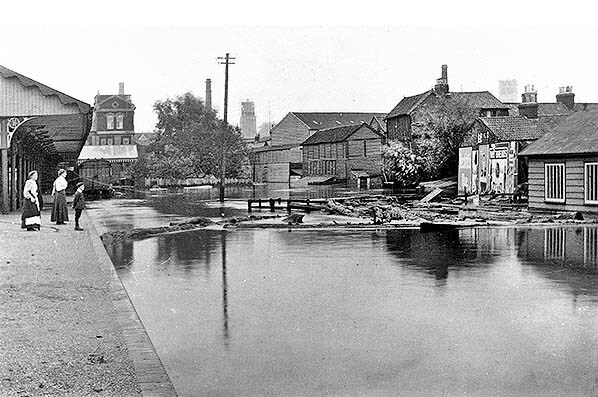 This and the following two views show the cleaning-up operation following the flooding of 27 August 1912. It is probably a day or two later as most of the water has now receded. 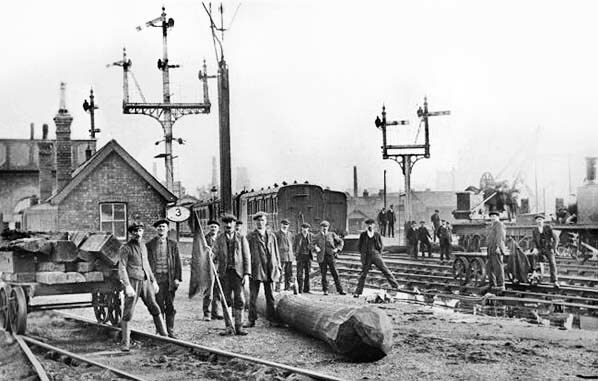 In the foreground a group of workers pose with a tree trunk which appears to have been cut off from its roots and the trolley, left, is loaded with wood of various shapes. The camera is facing towards the terminus and coaching stock can be seen at the platforms. The engine shed is behind and to the left of the camera. The water tower stands in the left background and the brick building between it and the camera is the enginemen’s mess. 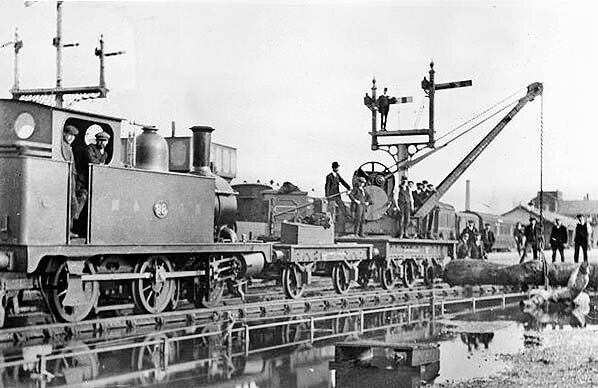 Note the somewhat frail-looking somersault signals and the locomotive and crane on the right. Also on the right but nearer the camera, some point rodding has received some damage. The oval plate bearing the number 3 is the speed limit. With the terminus visible in the background, we here see another view of the post-flood cleaning-up operation. The crane is in the process of removing a tree trunk and at far right is what appears to be a dislodged signal post. Information on the crane has proved elusive and the wording on the solebar of both it and its jib carrier are unreadable. 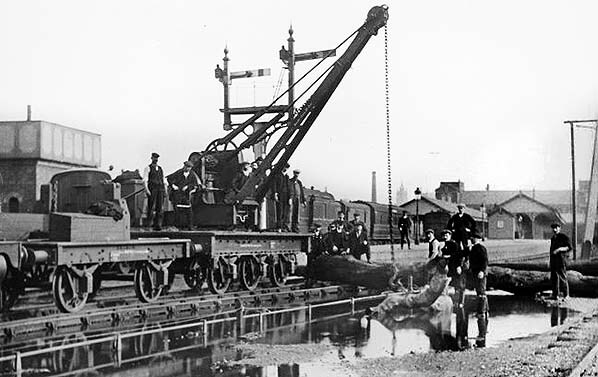 It is likely the crane had been sent to Norwich from Melton Constable where it was probably normally employed in and around the works. This view is similar to the previous but the man standing on the signal bracket tells us the two photographs were taken a few minutes apart. The locomotive is outside cylinder 0-6-0T No.98, originally No.14A, from a class of nine which the M&GN classified simply as 'Shunting'. The M&GN initials are placed either side of the numberplate i.e. ' M & - numberplate - G N' and the M&GN crest was located above the numberplate. The crest is just visible in this view and while photographs of these locomotives are not rare, very few show the crest with any clarity. The history of these locomotives is rather intriguing and confusing. Their origin was the Cornwall Minerals Railway ('Minerals', i.e. plural, being correct) which had eighteen examples. Of those nine ended up in GWR stock converted to saddle-tanks and of the remaining nine, some ended up with the Colne Valley & Halstead Railway and some with the M&GN apparently via the Lynn & Fakenham Railway. It is thought just three of the Cornwall examples came to the M&GN but mystery surrounds which three and the origin of the remaining six. The M&GN examples went on the become LNER Class J93 and three survived, just, into British Railways days but were never to receive their allocated BR numbers. 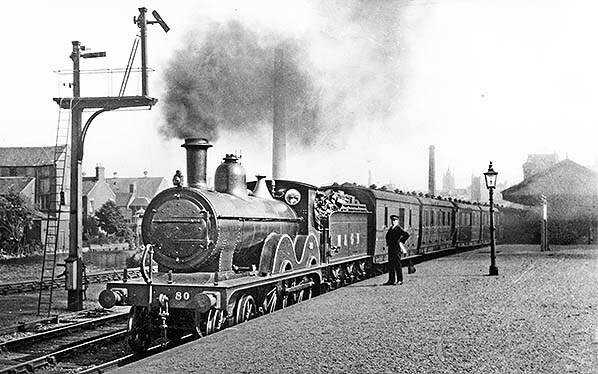 No.98, which was the oldest example and dated from 1897, was not among the late survivors, being withdrawn by the LNER in January 1947 as No.8482. Norwich City looking towards the station buildings from the east platform. The round baskets in the foreground appear to be crayfish pots, this being an age-old fishing industry in Norfolk.